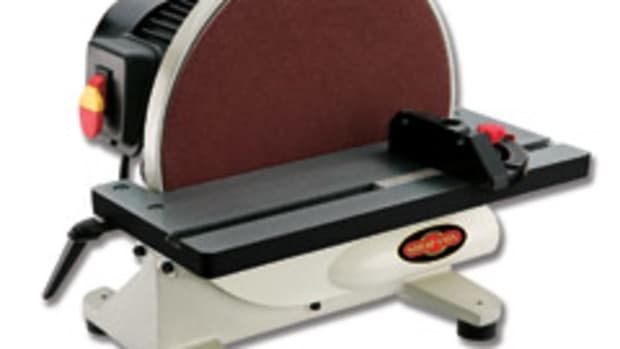 Woodstock International has introduced its Shop Fox 43" double-head wide belt sander, which features two sanding heads and a rear head equipped with an adjustable platen. The 25-hp three-phase machine, model W1757, has sophisticated digital controls and is aimed at commercial and industrial applications. 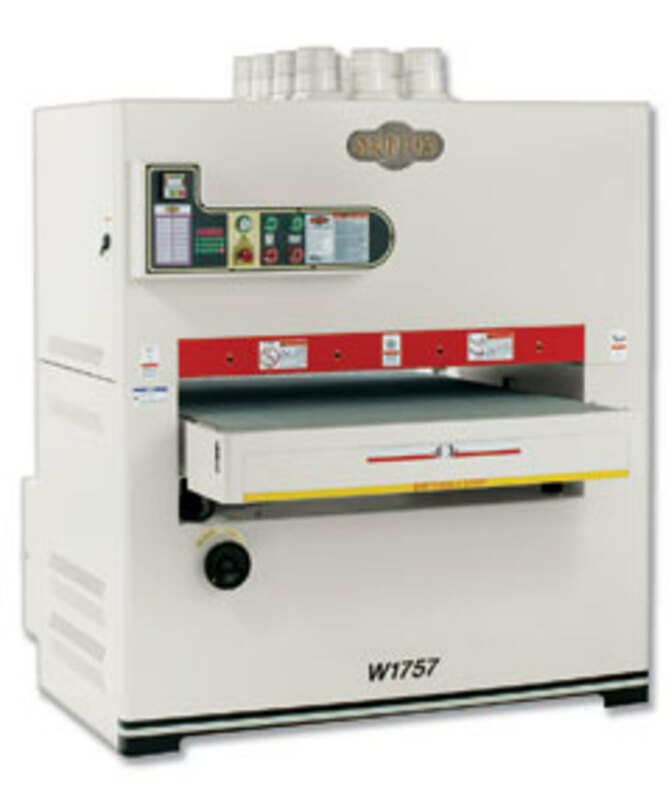 "The dual-sanding head on our W1757 has some very specific advantages over a single head," says Bill Crofutt, quality control manager for Woodstock International. 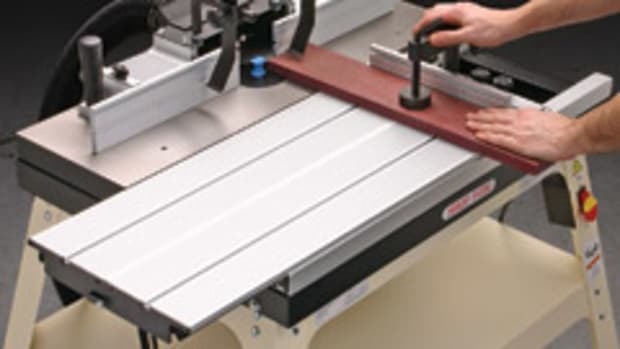 "First is the fact that two different grits can be used, allowing for single pass sanding operations that would normally require two passes with a sanding belt change in between. This can significantly reduce labor expense. The rear sanding head incorporates a micro-adjustable platen, which produces a smoother finish than sanders not using a platen and for heavy sanding jobs. 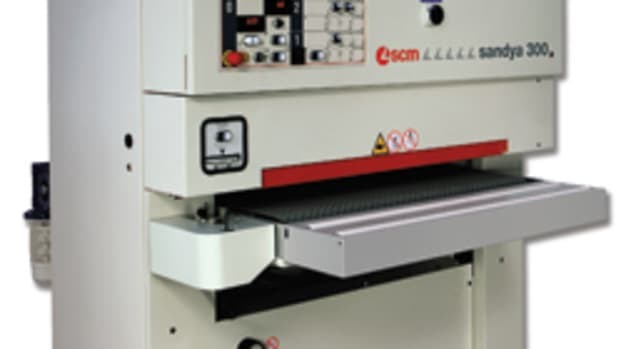 Also, the platen can be raised, allowing maximum stock removal in one pass." 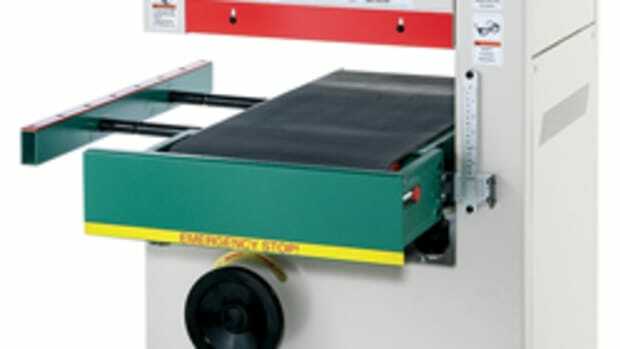 The Shop Fox wide belt sander accommodates boards up to 43" wide and 6" thick. The company recommends a minimum board length of 14" and minimum thickness of 3/16". The front drum surface speed is 3,543 fpm and the rear drum surface speed is 2,565 fpm. 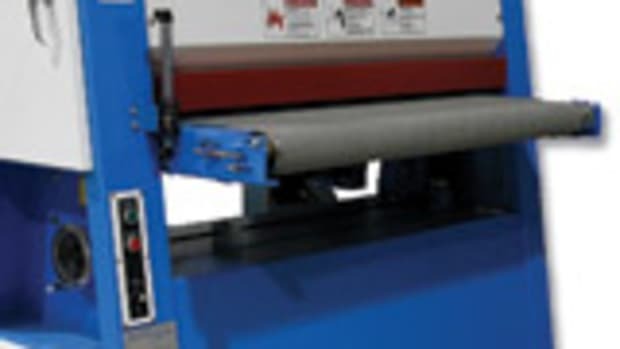 The conveyer has a variable speed rate of 14 to 60 fpm. "This machine uses a digital display for sanding head position that provides users simple, reliable and easy-to-set controls," Crofutt says. "There are basically two ways to use the digital controls. In most cases, the stock to be sanded will be dimensionally the same with regard to thickness. While staying within the limits of the machine, the final dimension desired is entered on the keypad. The other way is when sanding individual pieces, if you want to remove 1/64", you just set it to raise the table that amount. The display reads in 0.005", allowing the table to move in the same increments." 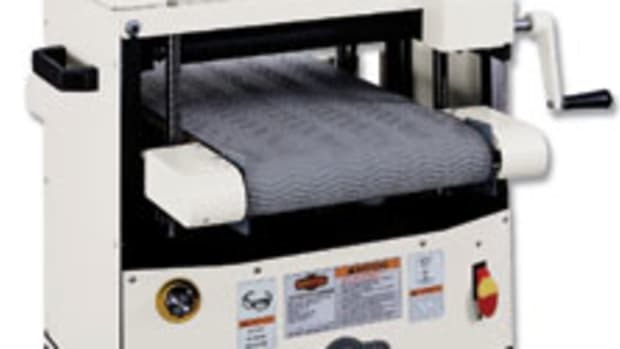 Other features include pneumatic belt tracking and tension, an adjustable graphite/felt platen, hard rubber infeed drum, rubber pressure rollers, a steel cabinet, disc brake for emergency stop and five 4" dust ports. 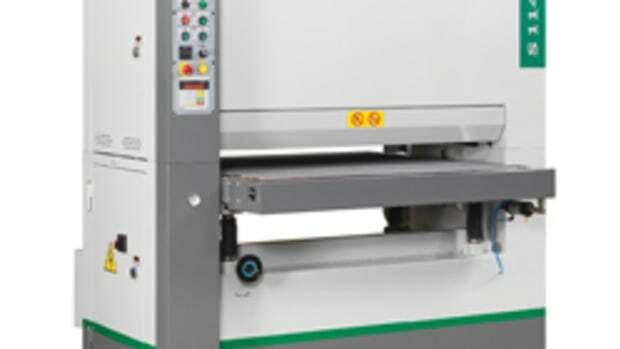 "Having the digitally controlled thickness, two sanding heads with the rear incorporating a platen, using a variable speed conveyor and having a 43" capacity all add up to make this a very versatile money-saving machine that will produce exceptional sanding performance for years. 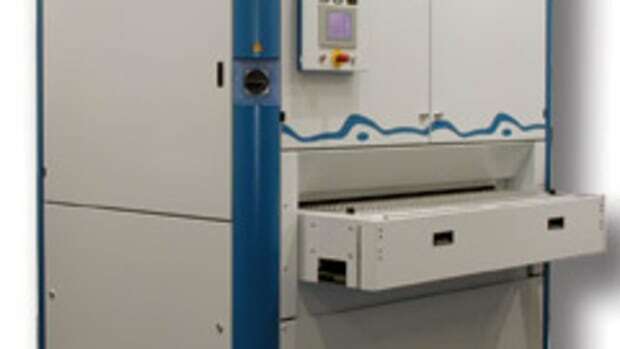 By using a single 25-hp motor instead of two smaller ones, we save a lot of manufacturing costs." 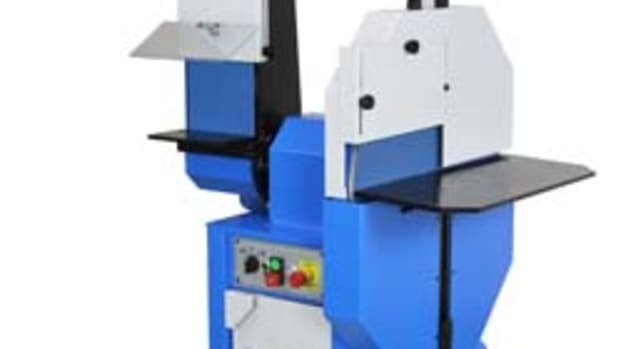 The Shop Fox W1757 43" wide belt sander has a 61" x 31" footprint, weighs approximately 3,384 lbs., and is priced at $23,325.